The Bonitafest was a fun event where children and adults had a great time. Several delicious food offerings were available which made it hard to choose what to eat. There were bands, choirs, dancers and other types of family entertainment on the main stage at Bonita Vista High School. There were also local businesses and government agencies giving out helpful information about services. BLUEtiful the clown was on hand offering beautiful face painting to support her son in band at BVHS. Children were treated to many designs including butterflies, fake scars and sugar skulls. While she was painting, David Hodges was taking pictures for the San Diego Union Tribune. 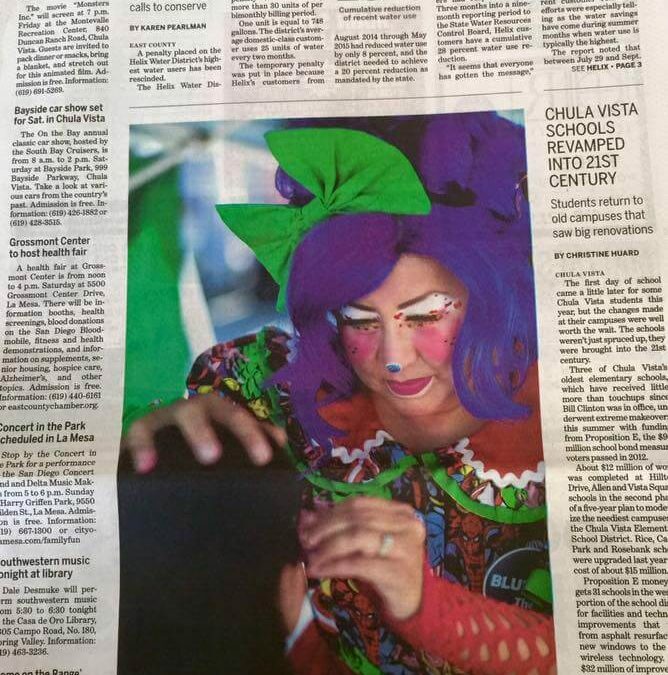 BLUEtiful was featured on the front page of the south east section of the newspaper! It was a very fun event. Thank you for the picture David!